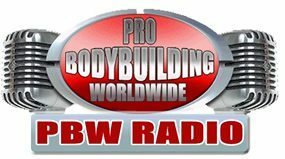 PBW Radio: Headlines from Around Bodybuilding! PBW Radio: Training Q&A, Matt Porter Visits! PBW Radio: Chris Cormier Live from Kuwait! Talkin’ Training on PBW Radio! Press Play to Access the Latest Show! PBW is proud to be featured on hundreds of Podcast directories. Click the iTunes Box to Subscribe! Q: How often is a new show released? A: PBW produces approximately 25 news shows a year. The broadcast season begins in February and runs until November (Holiday sabbatical December/January). Q: Is PBW available in podcast format? A: Yes, the show can be found on nearly every podcast directory, including iTunes. Q: Can I recommend a guest or a topic for the show? A: Yes, please use our contact form. Q: Can my company or product get a mention on the show? A: We work hard to support our sponsors and advertisers. If you’d like to learn about opportunities to promote your brand, please contact us! Q: How long has this show been on the air? A: We started Pro Bodybuilding Weekly in June of 2005. In 2012 the show became Pro Bodybuilding Worldwide. As we enter our 12th year, the show stands tall as the bodybuilding industry’s longest running multimedia production.